The Department of Human Geography was started in October 1959, at the initiative of eminent economist Professor V.K.R.V. Rao, the then Vice-Chancellor of the University. Professor George Kuriyan, a renowned geographer, was the first Professor and founder of the Department. In 1966, Professor V.L.S. Prakasa Rao succeeded him and remained until 1973. During this period, the department acquired a distinctive identity in India and abroad. In 1976, the department was renamed as the Department of Geography owing to the widening of scope of teaching and research activity in not only human, but also physical aspects of Geography. 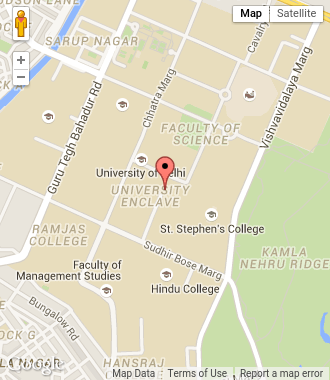 The Department is situated in the campus of the Delhi School of Economics in the North Campus of University of Delhi. The Department has faculty strength of nine, comprising four associate professors, and five assistant professors. The faculty of the department has also been associated with many institutions in India and abroad as Visiting Professors and Fellows, and as participants in seminars and conferences. The Department draws students from different parts of India and abroad for all its courses.